Written by Michael Small, Executive Director, Renewable Cities. This op-ed originally appeared in the May 5, 2015 edition of the Vancouver Sun. “Presidents announce principles. Mayors pick up the trash,” the dynamic mayor of Seoul, Won Soon Park, said recently at an international congress of cities committed to environmental action. He didn’t mean this as a declaration of modesty. Mayors around the world are doing more of the heavy lifting these days when it comes to collecting the trash generated by our fossil fuel burning lifestyle than most national governments. Vancouver is a prominent case in point. This city has already received international recognition for its Greenest City plan. In Seoul, it received even more attention when Deputy Mayor Andrea Reimer explained how Vancouver city council had just passed a unanimous resolution to develop a plan to move the city to 100-per-cent renewable energy in electricity, transportation and heating and cooling. This makes Vancouver the first city in Canada to make such a comprehensive commitment to renewable energy, joining cities such as San Francisco, Sydney and Copenhagen which already have 100-per-cent renewable energy goals. This commitment to a more sustainable future has put Vancouver at the centre of a growing network of cities that are leading the charge in planning for our transition to a fossil-free future. It is an exciting trend, which is surprising considering municipalities generally lack the financial or policy levers that provincial or national governments traditionally use to drive behavioural change. Despite this disadvantage, cities generally have a number of advantages when it comes to taking real action on climate change. First, cities are accustomed to approving and implementing long-term development plans, which span decades and different administrations. It’s the only way of having major new infrastructure built and managing future growth. Setting targets far into the future and then planning how to arrive there is what city planners do, week in and week out. Such long-term thinking gives cities a significant advantage over national governments, whose political time horizons generally extend only as far as the next election. Second, cities represent the greatest concentration of population, wealth, economic activity and, unfortunately, greenhouse gases emissions. Smart cities realize this is a significant opportunity. It’s precisely the density of urban life that makes it possible to achieve greater efficiencies in the way we use energy at a lower cost. Two of the three sectors that generate the largest amount of greenhouse gases — transportation and building heating and cooling — are directly influenced by city plans for public transport and building codes. Action taken in these areas can have a profound impact on the future sustainability of our planet. Third, in cities greening the environment and reducing greenhouse gas emissions is not some discrete, abstract goal. It is intimately connected to creating more healthy, livable, innovative and diverse places to live. The more attractive the city, the easier it is to draw top talent and businesses in a very competitive global marketplace. Cities that can phase out burning coal for electricity and cut down on traffic congestion can sharply improve their air quality. That’s very appealing to citizens and mayors in the mega-cities of the developing world. But it’s also a factor for Canadian cities. Taking tough new measures to promote zero-emission buildings, switching to renewable energy sources for city heating and cooling, and promoting the infrastructure for electric cars all contribute to driving the demand for new green technologies. Going green in this way isn’t just good for the planet, it is also good for the regional economy. It will help create even more jobs in B.C.’s already well-developed green tech sectors and add to the 14,000 renewable energy related jobs, which, according to a recent Pembina Institute report, already exist in this province. As Vancouver shifts its energy demand towards 100-per-cent renewable energy, that number of jobs will only grow. 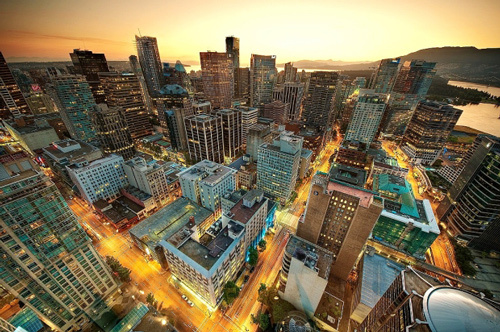 At Simon Fraser University, we’re hoping to help Vancouver accelerate this process. We will be convening more than 50 international experts and senior staff from more than 15 different countries next week for our Renewable Cities Global Learning Forum. We will be sharing the best ideas from cities around the world about how to increase our use of clean renewable energy. Mayor Gregor Robertson and his city staff will be using this forum to gather insights into how they can turn council’s 100-per-cent renewables resolution into a realistic, long-term plan. It is not going to be simple or easy; but we can borrow great ideas from the cities against which we already compete in the international marketplace for investment and talent. It is a goal worthy of Vancouver. It will keep Vancouver in the vanguard of cities that are tackling — not just talking — about concrete solutions to address climate change.